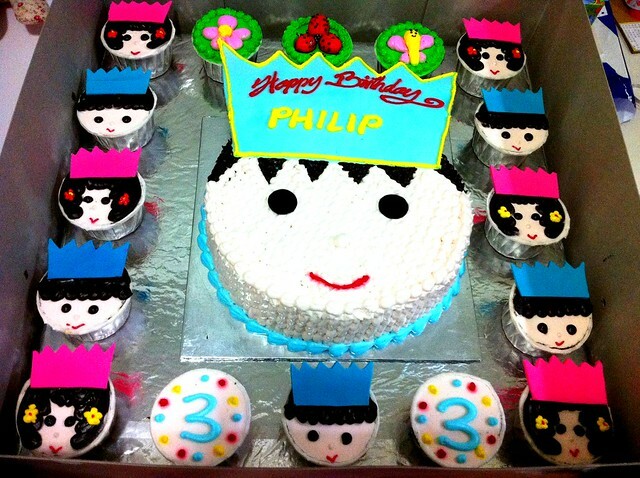 Food on Foot: Philip Turns Two! Philip turned two on 21 July 2012 and since he is more aware of the happenings around him, we decided to throw him a mini-party at the childcare centre. The night before, The Husband and I spent a good one hour wrapping goodie bags for the entire class. With the cake in the fridge, we were ready to go! The next day, when we walked into the classroom with the big box of cake and big sack of goodie bags, we caught Philip by surprise and the mood in the classroom was simply electrifying! The children were at first trying to peer into the box containing the cake and there were sounds of "Wow!!!" coming from the slightly taller kids who managed to catch a glimpse on their tip toes. Apparently, the children were very well 'trained' in birthday celebrations what with almost one birthday celebration in the classroom per month. The celebration took merely 30 minutes but the smiles on the faces of all the children are absolutely priceless!